Research released Thursday by an international group of scientists, including those from Australia, is creating a much more definitive understanding of how and when our ancestors evolved, and even what the climate was like when they did. It has long been accepted that the origins of humanity lie in Africa, and it was fossils recovered from the accordingly named "Cradle of Humankind" caves in South Africa which told us so. However up until now scientists have struggled to create a clear timeline for the fossils due to a lack of suitable dating methods available. 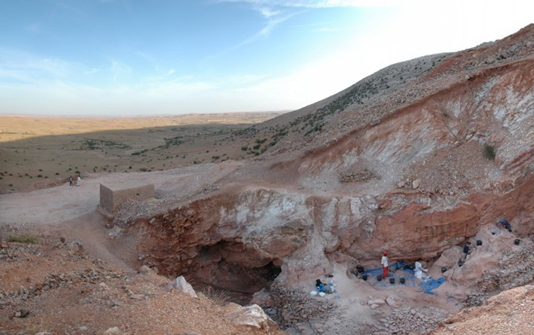 La Trobe University's professor Andy Herries who conducted research at the sites said that "while the South African record was the first to show Africa as the origin point for humans, the complexity of the caves and difficulty dating them has meant that the record has remained hard to interpret." "In this study we show that the flowstones in the caves can act almost like the volcanic layers of East Africa, forming in different caves at the same time, allowing us to directly relate their sequences and fossils into a regional sequence," he said. The World Heritage listed Cradle of Humankind caves have produced nearly 40 percent of all known human ancestor fossils, including the famous Australopithecus africanus skull, nicknamed Mrs Ples. According to lead researcher Robyn Pickering from the University of Cape Town, the team's dating provides "a model to explain the age of all the fossils from the entire region," as well as creating a picture of the climate conditions of our ancestors. "The flowstones are the key," Pickering said. Flowstones are deposits of calcite or other carbonate minerals which form when water runs into caves. "We know that significant flowstones only grow in caves during wet periods, when there is more rain outside the caves - by dating the flowstones, we are picking out these times of increased rainfall," Pickering said. Using uranium-lead dating techniques developed at the University of Melbourne, the team analyzed 28 flowstone layers which are sandwiched between fossil-rich sediment in eight caves across the Cradle - revealing the ages of the fossils to fall into six narrow time-windows between 3.2 and 1.3 million years ago. "We therefore know that during the times in between, when the caves were open, the climate was drier and more like what we currently experience," she said. According to experts, this is an astounding breakthrough which greatly contributes to humanity's record of itself and understanding into the lives of the common ancestors from which we evolved.